The Wells Fargo Foundation presented a check of $15,000 to support the YMCA of Delaware’s Take on Summer program. Established in 2015, the Take on Summer program offers teens who live in the stateof Delaware, free summer memberships to access the Y’s fitness facilities and swimming pools as, as well as participate in art activities, games and social events. The presentation was made at the Bear-Glasgow Y. In addition, teens are provided with a safe place to develop life skills, spend time with friends, receive daily nutritious meals and have a high-quality summer experience, a release stated. The grant is part of Wells Fargo’s commitment to improving low-income communities in Delaware. 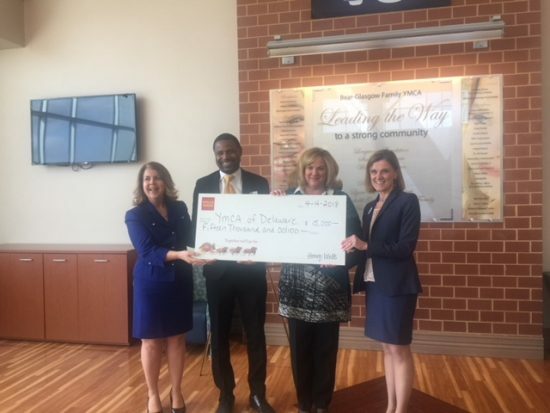 In 2017, the Wells Fargo Foundation and the Wells Fargo Regional Foundation awarded over $725,000 to Delaware communities and $286 million dollars nationwide. Take on Summer is a part of the YMCA’s larger efforts to close the achievement gap and support Delaware’s children and families. Last year, over 5,000 children and teens participated in summer camp and after school programs at YMCAs and partnering schools throughout Delaware. Nearly 1,700 of these children and teens received financial assistance made possible by donors such as Wells Fargo.